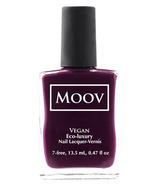 Moov Cosmetics is a 100% vegan and cruelty-free company. They never use animal ingredients or test on animals in the process of making their formulas. They stand by their "7-free" philosophy which is to produce quality nail lacquers that do not contain toxins such as toluene, formaldehyde, formaldehyde resins, Dibutyl phthalate, camphor, parabens, and xylene. All of their nail lacquers are of superior quality and contain a UV-inhibitor to ensure long-lasting results. Moov Cosmetics is owned and operated in Canada, and their formulas are ethically made in North America, not overseas.